THE NEW RETIREMENT AND HAPPINESS – A PIECE OF CAKE? After devoting a good part of life to their work, baby boomers are expecting a happy retirement. Sounds easy, right? Our experience of helping over 160 individuals plan their retirement, tells us that it is not always a piece of cake. Creating happiness in retirement often requires significant reflection to rediscover oneself as a person once work no longer takes center stage. For many people, this type of introspection does not come easily. And for organizations, new approaches that promote extending the length of their future retirees’ professional lives are not always easy to promote. It takes quite a bit of openness, flexibility, and understanding to ease the transition and transfer of knowledge of this highly experienced segment of the workforce to those replacing them. Our 2017 article, ‘’Everyone wins’’ (http://coachingretraite.ca/articles-2/)demonstrated the advantages of retirement planning at both the organizational and individual levels. We now want to acquaint readers with how individuals fare as they wind down their careers and experience the important transition into retirement. It is generally accepted that work and organizational transformations happen one individual at a time. We believe that a better understanding of baby boomers’ end of career journey may in fact benefit today’s changing organizations. 69% recognize that they have not yet distanced themselves emotionally from drawing their personal identity from their work. 57% realize that they have not yet planned how they will replace the benefits drawn from work, notably, how they manage their time, socialize and gain a sense of importance. their family and intimate relationships provide. 75% admit that they will need to devote significant time to the area of personal fulfillment in order to create more happiness now and in retirement life, to be able to savor the present moment and to find a new purpose in life. 66% feel the need to broaden their leisure interests and to develop new ones. Most future retirees start their transition with a good dose of optimism mixed with varying levels of fear and uncertainty. These feelings are normal as long as the negative ones do not get in the way of moving forward and taking positive actions. 47% have a positive attitude about retirement, but 53% recognize the need to have more of a growth mindset. 54% have a positive perception of aging and their capacity to achieve their dreams, however, 46% doubt whether they have sufficient vitality to do so. 48% favourably view their capacity to autonomously direct, influence and control life decisions, yet 52% admit needing to rely on others. 43% believe they have enough adaptability to deal with changes in their lives, whilst 57% recognize that they need more flexibility. 43% think they have achieved the level of financial security necessary to maintain the desired lifestyle in retirement, but 57% are somewhat concerned. 62% do not experience issues around dependent responsibilities, however 38% currently struggle in their caregiving role or predict having difficulties in the future. Baby boomers are used to organizational change. Once retired, they will experience many personal changes such as: potential change of residence, loss of important people in their lives, new social networks and friends, a shift in health and well-being, adaptation to a new financial reality. Each person handles change differently. Once ‘’the honeymoon’’ period (3 to 18months) has run its course with relaxation, travel, favourite past times, leisure activities, and catch-up time with family and friends, it is quite normal to feel a bit lost and experience an identity crisis. Questions such as ‘’who am I?’’, ‘’what is my purpose in life?’’ start to surface and require serious reflection. What are the stages that facilitate this transition towards a fulfilling retirement? Letting go of the identity defined by what we have done and accomplished in the past is the first step. The challenge is to redefine ourselves by becoming more authentic. This stage is about letting go of activities, possessions and accomplishments that were once deemed essential for our happiness and discovering new areas of interest. Making ‘’the new retirement’’ a reality by taking concrete actions in line with our definition for happiness. It is fascinating to discover how much positive energy can be generated by letting go of our professional identity and working on relationships and personal contributions to family friends, community and society. What has made you happy in the past? Why? 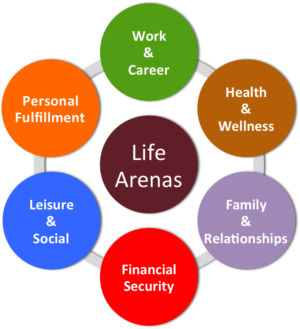 In which life arenas would you like to make changes to improve your life now and in the future? How could you introduce new activities into your retirement? How could you better enjoy present moments as they arise? Where will you find meaning in your retirement years? Personal fulfillment starts with a positive attitude, a growth mindset, and the curiosity to try on new ways of being and doing. Taking charge of our personal renewal one step at a time serves to strengthen our resolve and minimize the risk of depression. And by building our resilience to bounce back from life’s inevitable adversities in retirement, the transition feels easier. We all know people who navigate the transition into a happy retirement quite easily and others who struggle. Are we all capable of being happy? The research of Dr. Sonja Lyubomirsky (The How of Happiness, A Scientific Approach to Getting the Life You Want, 2007) concludes that 40% of the variation in happiness we see amongst people is attributed to elements within their control – their thoughts, feelings and actions. Genetic factors contribute 50% and what happens to us in life contributes 10% to this variation in happiness. Enhancing happiness in retirement is possible! The New Retirement can be one of the best times in our lives as we take charge and pursue happiness with intentionality. Through positive aging we can continue to grow and steer our lives in the direction we choose. Reinvention is the new baby boomer project. And what an adventure – even if it is not always a piece of cake!